If you have ever entered the magic that is a Lush store, you know how captivating the baskets filled with bath bombs and bath melts are. I am not going to lie – previous to this year, I thought baths were a waste of time. I have discovered that they can be super relaxing when using the right products and that brings me to Lush! Usually, I bring a chair in and watch YouTube while I relax in the bath with a glass of wine. The Charlotte store recently opened up in Southpark mall and I went it and got a nice supply of bath bombs and bath melts. I only have a few left now, but I will definitely be going back for more. I wanted a cute storage idea for them, and I ended up buying this gorgeous container from Marshalls for 6 dollars. You definitely cannot beat that! 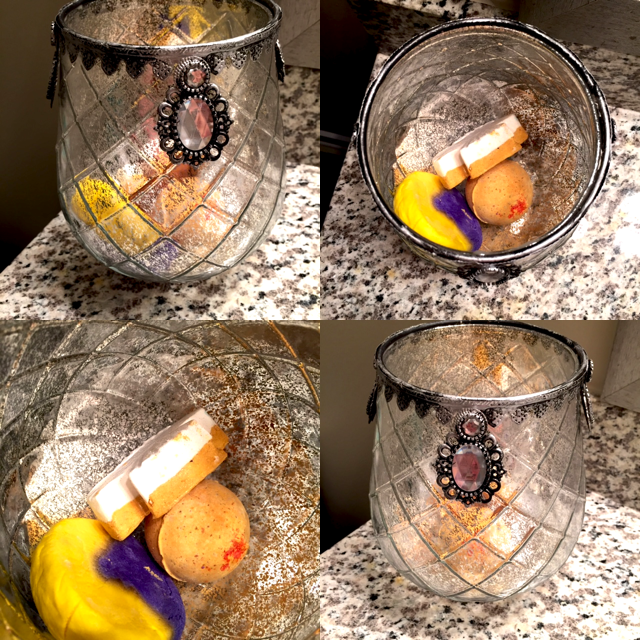 I keep this container on my bathroom counter – not only does it look pretty, but it keeps my products nice and it makes the bathroom smell like a mini lush store! I have to re-stock for sure as I used one of them last night. Have you ever tried Lush bath products? Any favorites? You can order Lush online, but you can also check to see if you have one in your town.